Looking for an easy to make dessert everyone loves? 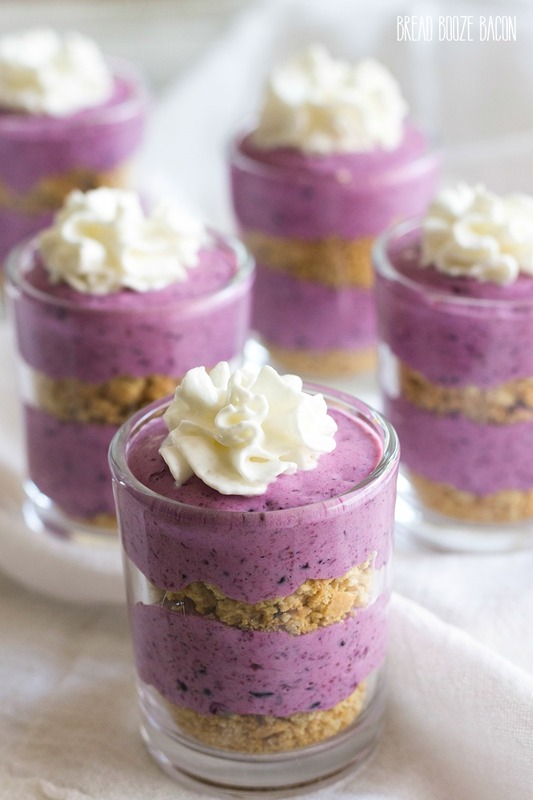 This No Bake Blueberry Cheesecake is it! The color is gorgeous and the flavors are even better! No bake desserts during the crazy hot summer months are my jam. As much as I’m obsessed with chocolate chip cookies, and I am, turning the oven on sounds like the worst idea ever when it’s 122ºF outside. 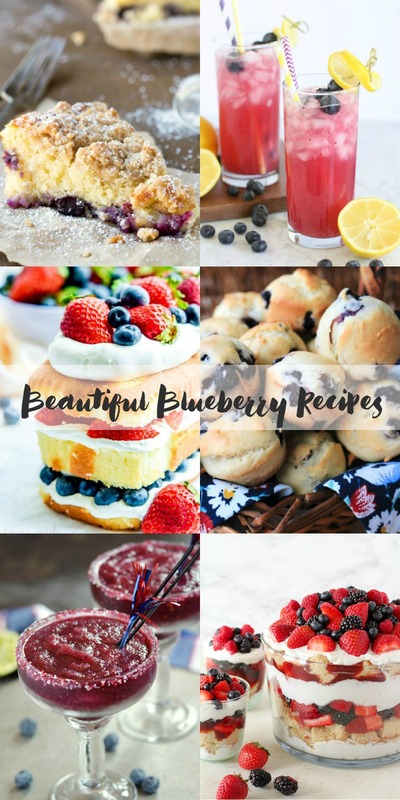 Over the years I’ve found ways to indulge my sweet tooth cravings and in the process have come up with some pretty killer desserts, if I do say so myself. This it totally one of those desserts. While strawberries are definitely my favorite summer fruit, I wanted to do something different for this recipe. So I grabbed some blueberries and whipped up this crazy good cheesecake! Talk about easy and delicious…and pretty. I don’t know what my thing is with blueberries but that deep purple color just draws me in! Now, I used frozen, thawed blueberries for this recipe. I wanted to make sure that if you loved it like I do, you could make it all year long. You could also use fresh blueberries in this recipe, but the color might be a little different. And if you want to take your flavor game to a new level, throw some lemon zest in your cheesecake mixture or some chopped almonds to your graham cracker layer! The number of servings you’ll get from this recipe really depends on the serving vessel. I made 8 mini desserts using these cups with cheesecake to spare. If you’re using mason jars you might only get 2 or 3 servings. (BTW, how cute with those mason jars be for 4th of July?!) If you choose dessert dishes you’re looking at around 4 servings. The filling makes about 3 1/2 cups total, so plan accordingly. 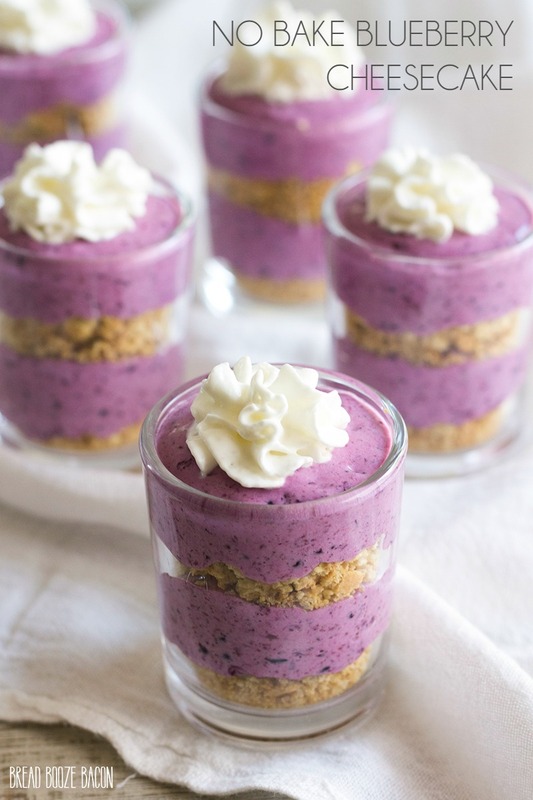 Are you craving blueberries now? Good! 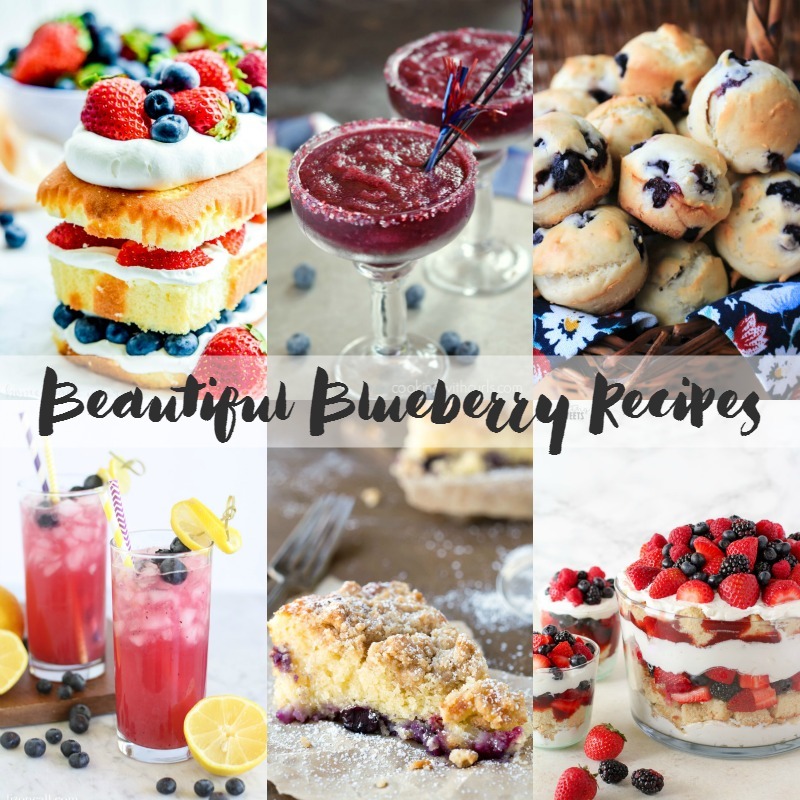 Becuase this month’s feast & devour cooking club is all about those beautiful blueberries! Below you’ll find recipes for breakfast, dessert, and drinks that’ll make you wish it was summer all year long! Place the gelatin in a small bowl. Pour the cold water over the powder and stir to combine. Set aside. To the bowl of a food processor, add the cream cheese heavy cream, and sugar. Cover and mix until combined and smooth, the mixture will be quite thick. Add the gelatin to the cheesecake mixture and mix to combine. Pour the cheesecake into a bowl and cover with plastic wrap - the plastic wrap should be touching the cheesecake mixture so a skin doesn't form. Refrigerate for 4 to 6 hours, or until the cheesecake is set. Place the graham crackers in a Ziploc bag. Use a rolling pin or meat mallet to crush the graham crackers into crumbs. Pour the graham cracker crumb into a small mixing bowl. Add sugar and salt and stir to combine. Pour in the melted butter and stir to combine until all the graham cracker crumbs are moistened. 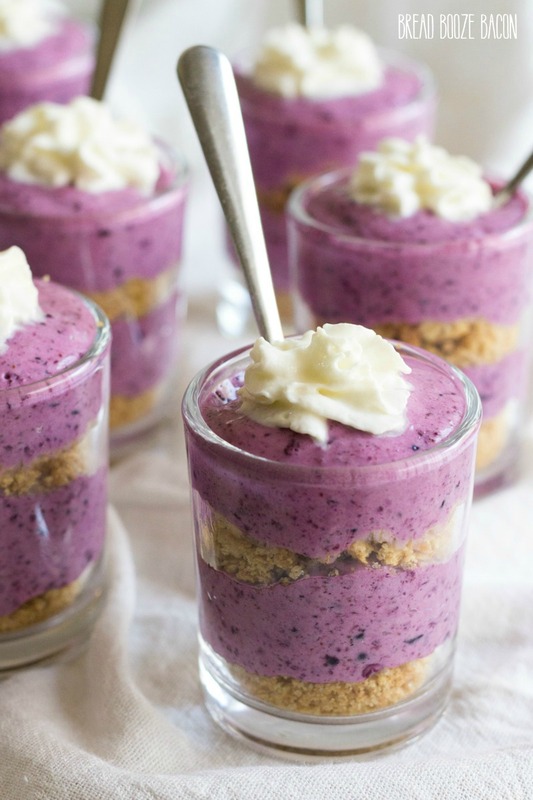 Add a layer of graham cracker crumbs to the bottom of a dessert dish (or mini dessert cup). Top the graham crackers with cheesecake so the dish is half full. Repeat the layers. 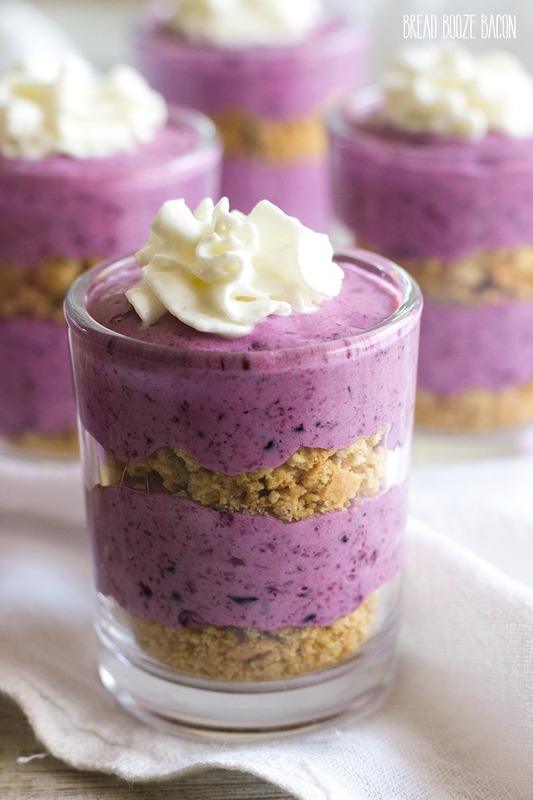 Top the cheesecake with some whipped cream, fresh blueberries, almond slices, and/or lemon zest to garnish. Server immediately. If you want to make a whole cheesecake instead of individual desserts, press the graham cracker mixture into a spring form pan so that the bottom and part of the sides of the pan are covered. Pour the cheesecake mixture into the pan. Cover with plastic wrap and refrigerate for 8 hours to overnight, until the cheesecake it set. To serve: Unlock the pan's outer ring and top the cheesecake with whipped cream, blueberries, almonds, and /or lemon zest if desired. Serve immediately.